Beth Kleber, chief archivist, has had an extraordinary role in the set up (from the ground up) of an institutional archive. 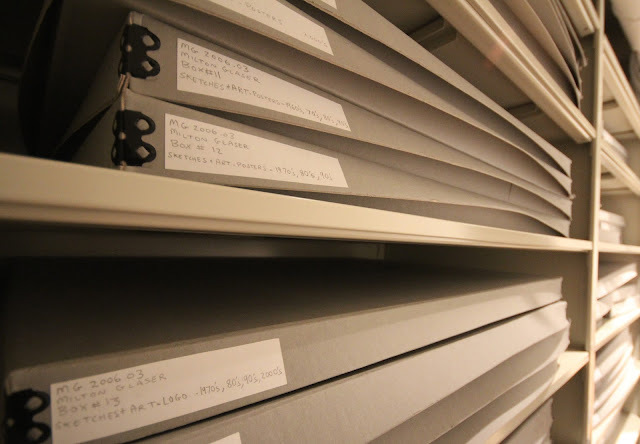 A librarian (with postgrad archive training via NYU's dynamite archive program) here in the SVA's Visual Arts Library for over 5 years, Beth returned from baby-making hiatus and was set to the task of archive genesis. It was borne from the longterm friendship between SVA founder and chairman Silas Rhodes and legendary designer Milton Glaser (responsible for, among many other things the iconic I ♥ NY campaign and logo). Mr Glaser wanted to create an archive of his work at the SVA. At this point there was no archive of any kind at SVA. While the school was figuring out where to put such a wonderful thing, Beth worked directly with Milton Glaser, in his studio. This took a few years. 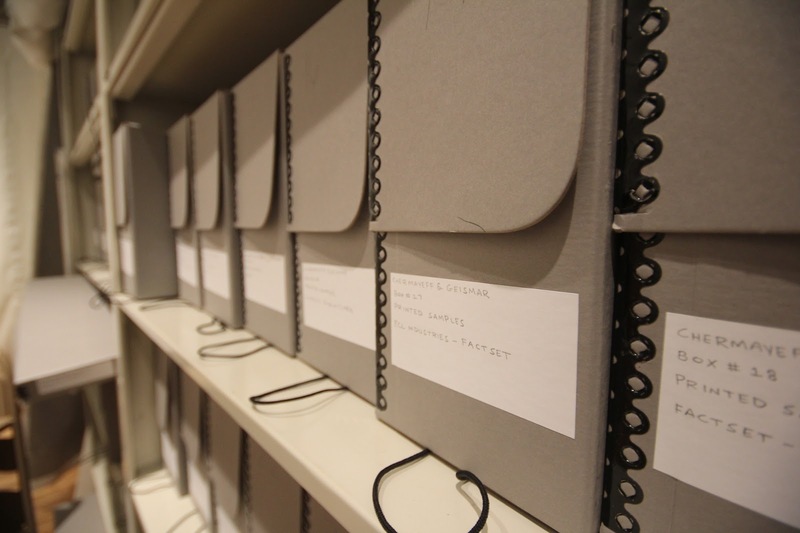 What an extraordinary boon for an archival collection. Beth worked through his effects, with him, to decide what to donate, and was able to speak with the creator himself on the significance of each item. Apparently no small task: Milton Glaser kept everything- every note, every napkin scrawled with ideas, plus all the original art and printed material. Beth gleefully referred to that time as her "Milton Glaser University" years. All info was dutifully databased as she went, but I am quite sure she herself is probably the most important Milton Glaser resource in the collection/basically anywhere. As it turned out, almost all the material ended up at SVA. The Milton Glaser Archive, with its antecedent Milton Glaser Collection was soon fortified by several other significant collections, such as Chermayeff & Geismar Collection (a firm that pioneered the abstract corporate logo), and the Henry Wolf Collection. Many of the designers included have a history with the school, usually through their excellent teaching program. See list of the Glaser Archive holdings here.